(Nanowerk Spotlight) Generally, a surface either loves a liquid drop (then it's called solvophilic – wetting) or hates it (called solvophobic – repulsion) when it lands, depending on several parameters of both the surface – like geometric roughness asperities or ups and downs and chemical composition – and the liquid – like surface tension or tendency of solvation. When water is the liquid the terms hydrophilic and hydrophobic are used respectively for this and for oil similar terms like oleophilic and oleophobic. Advanced material engineering techniques can structure surfaces that allow dynamic tuning of their wettability all the way from superhydrophobic behavior to almost complete wetting – but these surfaces so far only work with high-surface-tension liquids (see our Spotlight "'Nailing' superlyophobic surfaces with nanotechnology "). We also reported on a recent novel nanostructures membrane that can be switched between superhydrophilic and superhydrophobic behavior on demand ("Novel nanotechnology material addresses water pollution and oil spills"). And just recently, researchers in India have developed a superhydrophobic (where the contact angle between the droplet and the surface is approaching 180°) carbon nanotube (CNT) 'bucky paper' that shows fascinating wetting behavior as a result of an applied electric field, which could be remarkably tuned by changing key solution variables like ionic strength, nature of electrolyte, and pH of the droplet. More significantly, the droplet behavior can be reversibly switched between superhydrophobic, Cassie-Baxter state to hydrophilic, Wenzel state depending on how the electric field is applied. "Our findings may have important benefits for a wide range of applications of CNT surfaces such as design of biosensors, smart composites, variable lenses, and display screen" Dr. Vijayamohanan Pillai tells Nanowerk. "This novel material could have advantages in many fields of nanotechnology like MEMS/NEMS where we can either 'pin-up' or 'roll' liquid drops by applying an electric field. For example, this would enable further advances such as droplet-based microfluidic devices; a new generation of electrically switchable microreactors; adjustable lenses; lab-on-a-chip devices; 'smart' window glasses with alternate, electric field initiated hydrophobic/hydrophilic behavior for automotive applications; tunable aerospace coating which which will prevent ice formation; etc..."
Pillai, a researcher at the National Chemical Laboratory (NCL) in Pune, India, and head of its Materials Electrochemistry Group, together with his group, has published these recent findings in the July 30, 2008 online edition of Nano Letters ("Electric Field Induced, Superhydrophobic to Superhydrophilic Switching in Multiwalled Carbon Nanotube Papers"). The ozonolyzed dispersion of MWCNTs was then filtered through a PTFE membrane under vacuum, and the bucky paper on the surface of the membrane was peeled off and dried at 60 °C. By applying an external electrical field, the initial contact angle of the bucky paper of 156° (superhydrophobic) could be made superhydrophilic. 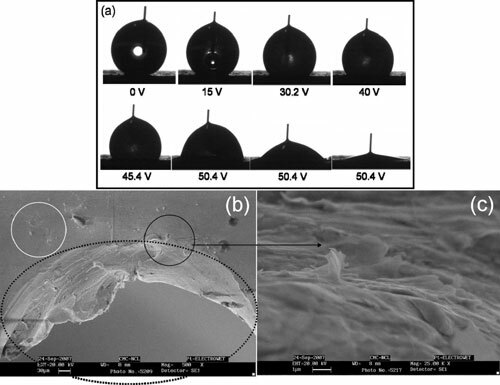 "A continuous decrease in the contact angle with respect to direct current voltage shows a remarkable tuning of the surface properties of nanotube paper, especially with respect to its change in its surface oxygen content," says Pillai. "The liquid remains suspended at the top of the bucky paper and forms a stable 'immobile ball' because of a slight pinning action with an angle of 156°. Interestingly, the application of electric field induces a transition from the superhydrophobic to the hydrophilic state where the immobile droplet undergoes a distortion which could be seen even with the naked eye. However, some of the liquid penetrates through the bucky paper substrate as a result of this transition. This could be attributed to the fact that the electrical energy induces both external and internal wetting (capillarity) due to the filling of the lumen of MWCNTs." According to Pillai, this novel, tunable material could remove some of the problems that were exhibited by microfluidic devices based on electrowetting. "For example" he says, "if you have a mixture of hydrophobic and hydrophilic biomolecules?that need to be separated, you you would first use a cartridge with the bucky paper to selectively remove hydrophobic?components. Then you apply an electric field and?remove the hydrophilic components."